I created this heart for Valentine's Day. I wanted something lovey-dovey to celebrate the day, hold the saccharin! 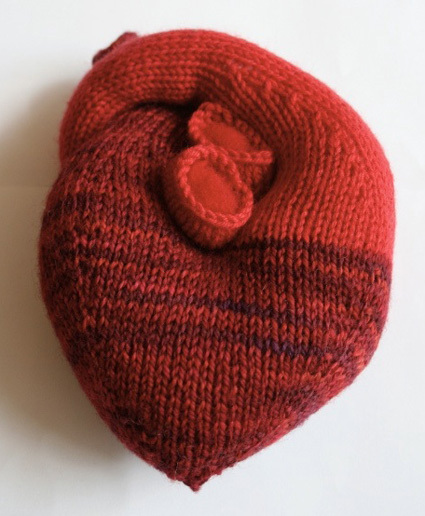 If you too wish to give away your heart to someone, or put it on the shelf, or wear it on your sleeve, this pattern may be the answer. It is a fairly simple construction, knit all in one piece, and is a quick knit project despite the small gauge. 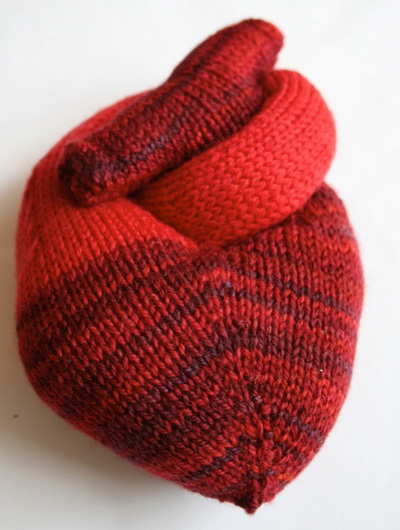 Note: 1 skein of each colour will provide enough yarn to make 3 hearts, with yarn left over. Using MC, CO 6 sts. Divide sts between 3 needles, placing 2 sts on each needle. Join to begin working in the round, being careful not to twist. Round 1: [Kfb, k1] three times. 9 sts. Round 2: [K2, kfb] three times. 12 sts. Each needle holds 4 sts. Round 3: [Kfb, k to end of needle] three times. 15 sts. Round 4: [K to last st on needle, kfb] three times. 18 sts. Rounds 5-14: Work as for Rounds 3-4. 48 sts: 16 sts on each needle. Round 15: K all sts. Round 16: Work as for Round 3. 51 sts. Round 18: Work as for Round 4. 54 sts. Rounds 19-30: Repeat Rounds 15-18 three times. 72 sts: 24 sts on each needle. Round 31: K all sts. Place first 36 sts of round on hold on waste yarn. Divide remaining 36 sts between needles, placing 12 sts on each needle. Join to work in the round. Rounds 1-6: K all sts. Round 7: [K2tog, k7] four times. 32 sts. Rounds 8-9: K all sts. Round 10: [K2tog, k6] four times. 28 sts. Rounds 11-12: K all sts. Round 13: [K2tog, k5] four times. 24 sts. Round 15: [K2tog, k4] four times. 20 sts. Rounds 16-21: K all sts. Next Round: BO 10 sts, k remaining sts onto one needle. 10 sts. From this point, divided valve is worked back and forth. Row 1 [WS]: CO 8 sts, p to end. 18 sts. Row 2 [RS]: CO 8 sts, k to end. 26 sts. Continue in stockinette st until divided portion of valve measures 2 inches. BO all sts, leaving a long tail. Fold divided portion of valve in half, so that BO edge meets CO edge, forming a tube. Sew edges together, ensuring that upper end of main valve tube remains open. Before proceeding, stuff first valve and heart body. Place 36 held sts on needles, placing 12 sts on each needle. Join CC, leaving a tail approx. 10 inches long. This tail will be used to sew valve in place once piece is complete. Important: Stuff this valve as you knit. When it is complete, it will be too narrow to stuff easily. Round 1: K all sts; using last needle of round, pick up and k 6 sts in gap at base of first valve. 42 sts. Rounds 2-6: K all sts. Redistribute sts so that there are 14 sts on each needle. Round 7: [K2tog, k to end of needle] three times. 39 sts. Rounds 10-30: Repeat Rounds 7-9 seven times. 18 sts. Continue in stockinette st until valve measures 8 inches. Place first 9 sts of round on hold on waste yarn. Divide remaining 9 sts between needles, placing 3 sts on each needle. Join to work in the round. Round 1: [K1, kfb] four times, k1. 13 sts. Rounds 2-7: K all sts. Place 9 held sts on needles, placing 3 sts on each needle. Join CC. Work Rounds 1-7 as for first half of divided valve. BO all sts. Weave in ends, except for CC tail at joining point between valves. Wrap second valve around first valve from front to back as shown in photos, then tuck divided end of second valve into space between valves, so that ends protrude at front of heart. Use CC tail to sew valves in place. Stuff ends of valves with red fleece or batting if desired. 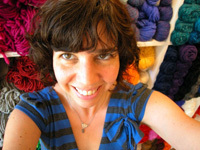 Kristin is co-owner of The Knit Café in Toronto, home of delicious yarn and gorgeous treats. She is a knitter of all things, but particularly invested in knitting sculptural objects and letting her imagination run amok. More of Kristin’s patterns and blog can be found on The Knit Café's website.